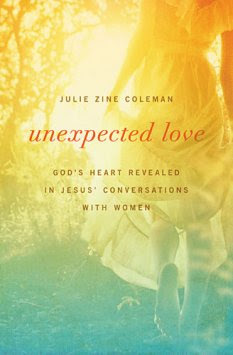 "Unexpected Love" written by Julie Zine Coleman was sent to me free by Thomas Nelson Publishing as compensation for my review of this book. The opinions given in this review are strictly my own. In biblical times, women were thought of as "second class" citizens. Men would not even be caught talking to women on the street for fear they would be caught up in her "seductions". In this book, it records conversations between Jesus and several different women. He treated women with respect, love and dignity. It is so interesting! It not only talks about the conversations with the different women, but gets deeper with sections like "Digging Deeper", "Food for Thought", and even how it would be relevant "For Today's Woman", and even a place for Journaling. For a small, paperback book, it is packed with interesting facts, and information. It not only helps us to get a picture in our minds about Jesus and the women he came in contact with, but also kicks our brains in gear and gets us thinking about our own relationship with Christ and a conversation He might have with each of us if we were face to face here in this physical world together. I would recommend this book for women everywhere. This book is exceptional in helping us to understand Jesus' heart toward women. We all ache for a deep relationship with Him and His healing touch, just as the women back then did. each of the women in this book approached Him with something they needed, such as wine for the wedding guests, healing an issue of blood, the adulterous woman needing re-assurance after being condemned by the townsmen, and several other instances. It shows His compassion for us even in a time period when most men would count us as nothing. Jesus ALWAYS gave them more than they expected. There are nine women, nine separate conversations. As Julie said, nine encounters with the Savior whose carefully spoken words changed everything. There were no common threads. These woman came from all walks of life. The ONLY thing they had in common was that they ALL needed Jesus Christ, just as we do. He was interested in them, just as He is with each of us. This book shows us just how much. As well as helping us to develop our intimate relationship with our Savior. 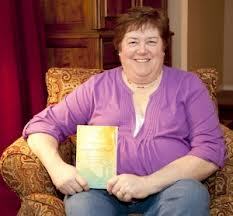 Julie Zine Coleman has an MA in biblical studies and is a popular retreat and conference speaker. during her twenty-year teaching career, she was named Teacher of the Year in Ann Arundel County. Julie and her husband live in the Annapolis, Maryland, area. You can find out more about her ministry at www. juliecoleman. org. She is dedicated to helping others understand the Bible's message and experience it's transforming power. It also says that additional free resources for study and group leaders are available at www.unexpectedlove.org. I really enjoyed this book because it definitely gave me "food for thought and gave me a different perception of not only my relationship with Christ, but His with me as well. Thanks for the review. Lord bless you PJ. I feel a little out of place here because I'm not a religious person at all, but I thought I'd stop in and not only say hello but maybe help get a conversation started for you. :) I wonder, out of curiosity, what it is that you feel makes men today feel as though they should disrespect women and treat them less than Jesus would have treated women in the past? I always love having conversations with people about how they see things and where they're coming from? :) Nice review, by the way! Thanks so much for taking the time to read my book! I appreciated your kind comments. I'm so glad you liked it.